Ever since I learned and played Faure’s Theme and Variations, I have been bitten with the Faure bug. His music is very intoxicating, and I have my teacher Marian Hahn to thank for introducing me. Others like Ken Johansen and Roy Howat have also been instrumental in the development of this new love, as their lives intercepted mine. Now at IU I’m in the company of wonderful pianists like Jean-Louis Haguenauer and Emile Naoumoff, the later of the two who has transcribed Faure’s requiem for solo piano! I hope you enjoy this new addition to my collection of videos… Gabriel Faure’s first Nocturne in Eb minor. Hi folks, just to let you know of a new addition today, a live video of Beethoven’s Piano Sonata No. 27 Op. 90. Took me a while to put together because I’m having issues with audio and video syncing. It all seems to change after uploading to youtube, you’ll just have to imagine. Its been a while since this site’s seen any action, from both you and I! 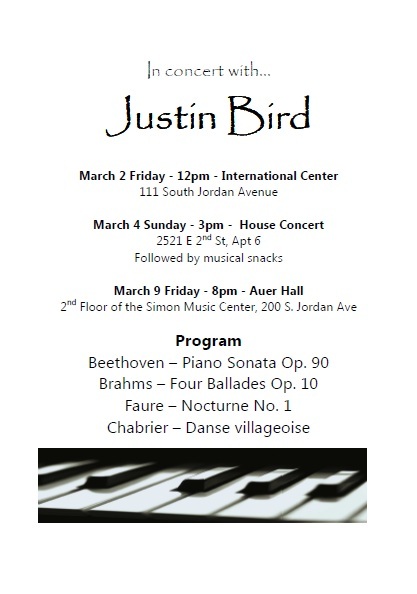 I think you’ll enjoy this latest addition… a full recital I gave recently in Bloomington, Indiana. The piano was a beautiful hamburg steinway (although voiced to sound more like a new york) in a wonderful acoustic: Auer Hall. I hope you enjoy, please share them around and comment on the soundcloud music player if you like any of the tracks. … is now uploaded! Head along to the Video page to see. Check out the Video tab. Please subscribe and follow below the site so you can get emails when I upload new content. Hello I’m Justin Bird and welcome to my website. Keep coming back for updates and new music recordings and recitals announcements. I look forward to your comments about what you think!